Want some real engagement with your audience? Hire a full-size Formula One Simulator and we can guarantee that you’ll draw in a crowd. Rather than following the status quo, such as handing out leaflets and giving mind-numbing presentations on why your company is so great, why not hire a Formula One Simulator to leave a lasting impression instead? Built to exactly the same specification as our show cars, our fleet of Formula One simulators also have state of the art simulation technology built in. 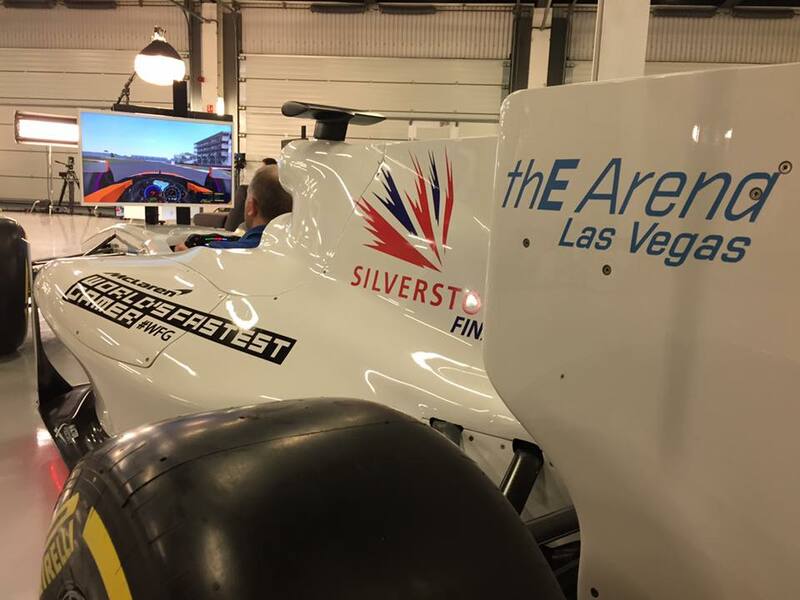 As used by many Formula one teams, the professional software, steering systems and pedal boxes we use will give your guests and visitors the most realistic F1 experience possible. Just some of the features of our cars include, fully adjustable pedal box to achieve the very best driving position, full force feedback steering systems to provide an incredibly real driving experience and a full sound pack to emulate the sound and feel of an F1 car. We deliver your event just the way you want it. Whether you’re looking for a historic Formula One race with Senna and Sterling Moss at the wheel – or wanting to race the very latest Formula One cars, the range of races we can deliver is easily the best in the market. Couple that with an abundance of all the Grand Prix circuits around the world, with us, you have the power to build your very own motorsport event that is truly unforgettable. 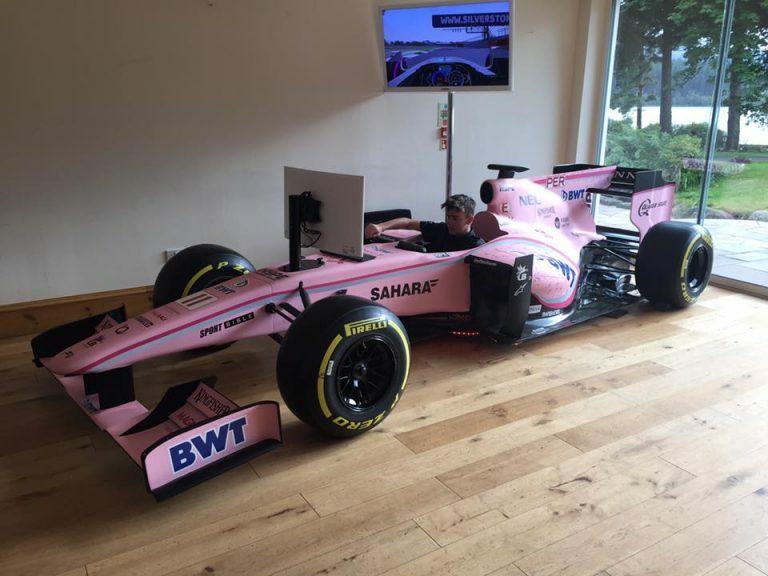 Formula One Simulators are great for high throughput events and with sessions as quick as 5 minutes if desired, they are fantastic for exhibitions, corporate events and product launches. With the Formula One Simulators that Max Velocity Events have to offer, you get to enjoy the experience of being behind the wheel of the world’s fastest cars, with less risk, for a lot less! You also get to experience the thrill of being cheered on by crowds, especially if you choose to hire one for a team building event or a company promotion. Our Formula One Simulators are fully mobile, so we can come to you whether you’re UK based or somewhere else in the world. Not only that but we also supply our highly trained pit crew too. We have taken into account the desire of Formula One superfans to drive the world famous cars they’ve grown to love, which is why we never fail to deliver bespoke events tailored exactly how our customer wants. We provide professional race software, pedal boxes and steering systems that are actually used and preferred by Formula One teams. Thanks to our expensive technology, we ensure that our guests and visitors enjoy the perks of taking part in a genuine, realistic Formula One driving experience, minus the danger. Our experts will give you a short, but educational brief which will help you to understand how to drive the Formula One simulator – as it’s not always as easy as you might imagine. This way, you can enjoy the fun and the exhilarating process just the way you intended. These Formula One Simulators will certainly put your driving skills to the test and with our full surround sound system, you will be participating in an incredibly real driving experience. Our full sound pack is created to emulate the sound and feel of a Formula One car. The experience of being in a Formula One simulator gives you the complete freedom to develop your driving skills as if you were actually whizzing around the world’s most renowned racing tracks, except it’s with the assurance that your safety is guaranteed during our activity. Above all, we excel at offering bespoke packages to our guests and visitors. We create a unique event taking into consideration our customer’s individual requirements. Our best events often incorporate multiple activities, such as our popular pit stop challenge and kit karts. When hiring our Formula One Simulators, you can personalise the car with the help of our design team as the full-size Formula One Show Car used is fully brandable. Your logos and unique messages can be built into our software, meaning that your guests will be seeing your branding whilst they race around the world’s most famous circuits. For more information on what we provides feel free to contact us and we will be happy to answer any of your questions.